Domestic, But Not Martha blog. (Thank you lovely Miss Crystal!!). oooh, ok.... (I suddenly feel a little naked, oh I promise I am NOT though!!!). My soul mate (now my Hubby) and I embarked on two extended backpacking trips, first for 18 months and the second time for about 9 months. I have been to about 27 countries (lost count now). Very many more are on my wishlist. 2. I LIVE TO EAT - not Eat to Live!! I don't smoke and hardly drink alcohol - food is my 'vice'!! I also enjoy cooking and baking, but I don't tend to follow recipes very often!! 3. I ♥... flicking through piles of magazines, (especially when they have perfume samples amongst the pages), browsing in bookstores, sprinkling French lavender oil on my pillow, sipping Earl Grey tea (no milk and weak) from my favourite mug, chocolate for breakfast, cake for lunch (not in the same day of course!! ), afternoon 'Nanna' naps, cuddles with my boys and holding their little hands in mine.... oh and so much more stuff!! 4. My last job was as Textile Designer for the famous Australian artist - Ken Done. I decided before I moved to Australia that I wanted to, and lucky me my wish came true!! 5. I'm scared of heights, but challenged myself to an abseil! 7. I am allergic to bee and wasp stings (we're talking full-on Anaphylaxis!!). (Hey I don't even have any fllings (cavities) and still have 20/20 eyesight!). 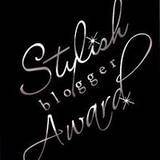 Award 15 Stylish recently discovered bloggers. ...and finally for good measure - one I discovered only today! I think I kinda cheated on that last one... ho hum, naughty me!! My 'baby' started big school yesterday (Look isn't he sooooo cute in his uniform? ), and my other little man has started pre-school, and they are both sad...so my head is all over the place! Hope your week is going well, I'm sure some of you have got kids starting or going back to school around now too. Congratulations on your fabulous award! I love reading your blog!!! Congrats also on your babies venturing off into the big, wide world. May they have many new and wonderful adventures along the way! You're soooooooooo worthy! <3 Love your heart new friend! so great to read a bit more about you SAlly! ((hugs)) for passing the award on..will try to do my post this week! Treasury Time ~ "Give me Colour"